According to the American Burn Association, there are approximately 500,000 burn injuries each year. This estimate includes 3,500 deaths from residential fires, 500 from motor vehicle and aircraft crashes, contact with electricity, chemicals, hot liquids and other substances and sources. There are approximately 40,000 annual hospitalizations for burn injuries. Approximately 60% of these admissions are to specialized burn centers. Many people will sustain substantial or permanent disabilities as a result of their burns. The skin has several layers. The deeper the burn injury is, the greater the number of layers that are damaged. Sweat glands and the roots of hair follicles are in the deeper layers and will be destroyed with a deep burn. Deep burn injuries heal more slowly, are more difficult to treat, and are more likely to have complications than superficial burn injuries. 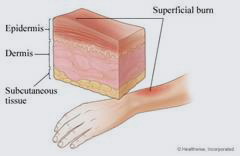 A superficial burn, also known as a first degree burn, is a burn injury to the epidermis (the top layer of the skin). 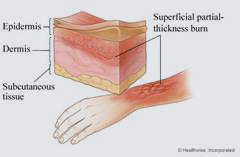 Injury to the dermis (the second layer of skin) is called a partial-thickness or dermal injury, also known as a second degree burn. An injury that extends down to the subcutaneous tissue, which includes fat is called a full-thickness injury, also known as a third degree burn. Burns that damage tissue underneath the subcutaneous skin layer are described as full-thickness burns, also known as fourth degree burns, include injury to the underlying muscle. Superficial burns normally heal within 5 to 7 days. A common type of superficial burn is a sunburn. Because the epidermis is thin, about the thickness of a piece of paper, it is easily replaced. Even when skin is not injured, the body completely replaces the epidermis every 45 to 75 days. Healing from a superficial burn usually occurs without scarring, although there may be some permanent discoloration. The dermis is 15 – 40 times thicker than the epidermis. As a result, the seriousness of a partial-thickness burn depends on how much of the dermis has been damaged. A deep and large partial-thickness burn will usually be treated with painful skin grafting. Partial-thickness burns usually leave scars for life. A full-thickness burn destroys all three layers of skin. The result is not only the loss of skin but also the hair follicles, sweat glands, and the region where new skin cells are formed. For these reasons, full-thickness burns require painful skin grafts. Burns are usually physically and psychologically devastating. Burn victims/survivors wear the scars of their trauma for the world to see. Fortunately, as a result of medical advancements the survival and mortality rates have significantly improved. Some of these advancements, though beneficial, often include painful and sometimes lifelong medical treatment. The long-term effects from physical, emotional and economic damage can often last a lifetime. With recovery comes a need for support and information to cope with the physical, emotional, spiritual, and legal needs that remain with the physical scars. At Maas & Marinovich, as a burn victim we understand your long-term effects and needs. We are here to help you and your loved ones. We make sure your rights are protected, coordinate quality medical care and rehabilitative services, and make sure your medical bills are taken care of. We conduct a thorough investigation, recover your lost wages, and make sure you are fully and fairly compensated for your injuries. Let our 28 years of experience and specialized skills help you through this most difficult time. Call us at (213) 386-7586.